For reasons, which were beyond our control, we publish this article only today, not in the end of January, when we mostly prepared it. We have one month to estimate innovations of the company and compare them with rival products, which are not officially announced. To say the truth, first conclusions were not considerably changed. T610 is a phone of the new generation and other players will try to reach namely this model. Today’s world’s presentation gives us permission to public review of this phone. We kept our promises and haven’t done it before, though many our visitors ask us to publish it earlier. We thank everybody for patience. It was just an introduction… now, please, read our review. 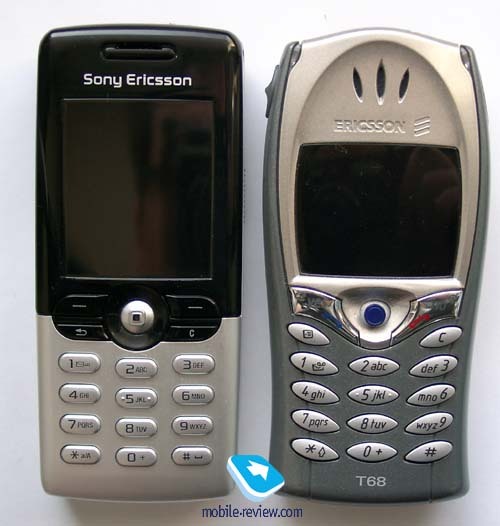 Launching of Ericsson T68 caused really a sensation on the market as it outrun all other models approximately for 1 year. As a result demand for this phone was really incredible. For the first time the company couldn’t satisfy all customers, because it just didn’t have so many phones. 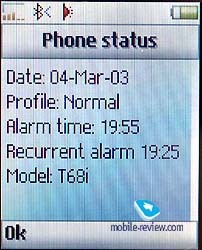 Potential of T68 was fully realized in Sony Ericsson T68i. It supported MMS-technology, which wasn’t realized earlier just because providers didn’t support this service. It was possible to transform T68 into T68i just by firmware changing. Hardware of the phones was the same. The company expected a high demand for this renewed phone and filled all warehouses with it. If you count total sales of T68 and T68i, they will be closed to maximum in this market segment. The other fact, which proves that T68 became a pioneer in its field, is that such phones as Siemens S55, SL55 are based on the same platform. But don’t forger that this two models are regarded to be modern phones and moreover, not long ago Siemens S55 was the most advanced phone on the market. 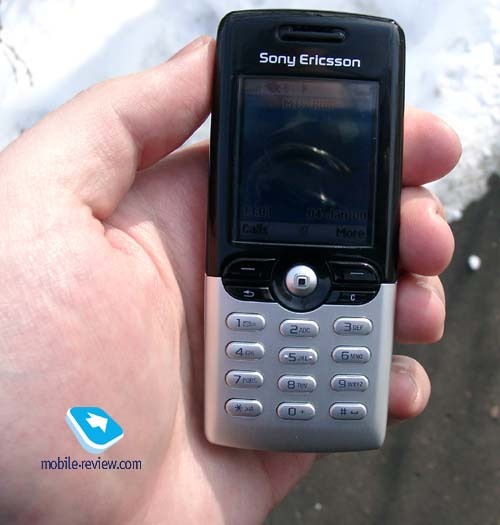 The situation changed after introduction of Sony Ericsson T610. One more time the company overrun the time and set a new standard for this kind of handsets. T610 is based on the same platform as T68; all last corrections were taken into account. Besides, developers built-in a camera and renewed software. It’s a nonsense that the company created a new product on the old platform but it was available thanks to its flexibility. All innovations are connected with revisions of existed functions. They became richer than they were. First, what you notice when see the phone is a severe design. The handset looks very attractive and elegant; we think it is made in retro style to some extent. Usual and mat plastic (around the screen) and anodized aluminum are harmonically blended with each other. On the one hand, a plastic rim of the screen is very nice, but on the other - it is easily soiled. Unfortunately, grease stains remain on it after using. It’s not very noticeable from afar, but clearly visible when you see it closer. Originally, three colors will be available on the market - Aluminum Haze, Abyss Blue, Volcanic Red. 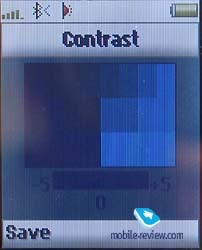 Rim of the screen remains the same in all phones, only colors of rear and partly front parts (lower part) are changed. Our tested sample was silver. We think that this color and blue one are the most attractive for customers. According to the company, T610 is a sample of industrial design. By the way, for the first time it is known the designer’s name of this model - Erik Ahlgren. We would like to thank him for that great job he’d made. The phone is really nice from aesthetic point of view. Phone dimensions are 102х44х19mm and the weight is 95 grams. The phone is handy and very pleasant to touch. There is an illusion of metallic surface. 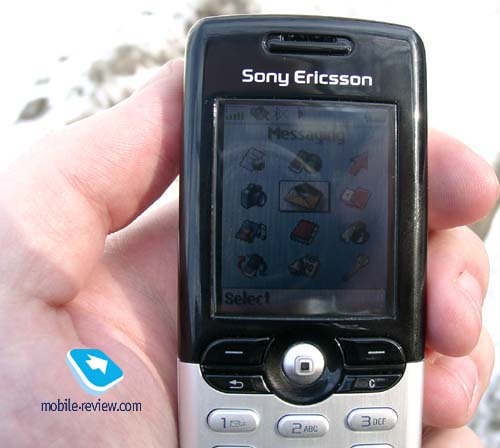 A power on/off key is placed on the top of the phone, what is not typical for the phones from Sony Ericsson. Despite from Nokia phones, this key has only the main function. Sides of the phone are slightly deepened into the phone, therefore volume keys are very comfortable to press in the talking mode. When you press them in standby mode, you can see a current profile, date and time, but not an approximate operating time, which was so pleasant to see in the phones from other manufacturers. Availability of this function is logical and we hope that it will appear in the next versions. An upper key, which is used to control a camera, is also very comfortable. On the contrast, right side key is not very convenient. It is used to browse Wap from standby mode only. Engineers didn’t assign voice memo function to this key. May be they will do it in first commercial samples of the phone. A standard system connector is placed on the bottom of the phone. All old accessories are compatible with this handset and it is a big advantage of this model. Now some words about the screen. It is known that the phone is equipped with STN 65K display, which has a resolution of 128x60 pixels. The screen occupies the largest part of the phone. It contains up to 6 text lines, 1 line with icons and 2 service lines. 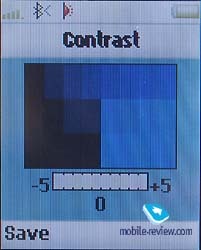 A user can adjust contrast of the screen. Extreme values are very different. When the phone is in standby mode, no information is visible on the display. You can switch on a traditional screen saver (clock). In this case power consumption will be increased. 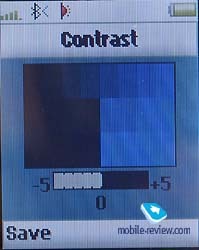 A switched off display is merged with a black rim of the screen. When you move a joystick or press a key, the display revives and a picture appears. The picture has a high quality but in our opinion the STN-screen not so good as TFT. One of the arguments for this statement is that the information is not clearly seen in sunny day. Even in January it was very difficult to read something. As you understand it is impossible to do it under spring’s sun. As we’ve mentioned graphics quality is very high. You can see a picture without artifacts, a pixel size is minimal. Generally speaking, it is the best screen in this class of phones for today. It would remain the leader in September too, though it will have competitors. A shortcoming of the screen is connected with phone dimensions. It has a small depth, hence, when you press the screen, you can see moire fringes. Test fields showed that it’s not a problem in everyday using. The phone could be worn in hostel or squeezed in hands. Picture quality is quickly restored. Compared to displays from Samsung the display looks dim, the information is difficult to discern under the sun. Nevertheless, there are no rivals among European analogues. A navigation joystick, which is positioned under the screen, can be pressed. It is very comfortable. You can see a service indicator in it. It is almost not noticeable in stand-by mode, what is the also a virtue of the phone. It’s not irritating by blinking when it lies near you on the table. All keys are made of plastic. They are rather comfortable and response well to commands. Characters are marked by slim font size, hence, they are not visible in all lighting conditions. The phone has a pastel blue backlighting. Camera is placed on the rear part of the phone. A lens is not covered; it is just deepened into the phone, what protects it from accidental scratches, but not from dust. A rear part of the phone can be easily removed if you make a slight effort. The construction is reliable; this part doesn’t have any backlash. As time goes by, small backlash can appear (for example, we noticed that a small backlash appeared after a month of active using in our phone). The example of the rear part shows how the phone is formed. There is a lower level of plastic – a base, which is covered with anodized aluminum, its thickness is about 0.6-0.7 mm. Such construction provides good protection while fallings. 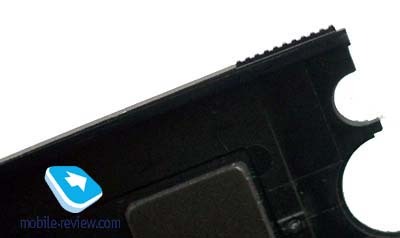 The other interesting thing is that a rubber cover, placed on the internal side of the phone, is used to fix the battery. Few words about the battery. The phone has a lithium-polymer battery of 750 mAh capacity. According to the manufacturer, it can provide up to 14 hours of talking time and up to 400 hours of standby time. The phone doesn’t have such autonomy when you use even all features. 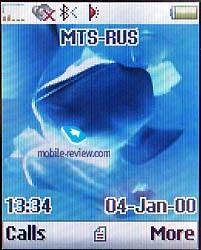 For example, if you talk about 1.5 hours, use bluetooth during one day and sometimes activate IrDa, the phone can work operate about 4 days (Moscow networks, Beeline, MTS). Other applications were used about 20-25 minutes. The longest autonomy in case of minimal using of different applications and 2 hours of talking was about 5 days. These results are comparable with ones of Sony Ericsson T68i. Taking into account more advanced phone capabilities and better screen, it’s not bad. A time of full re-charging is about 2-2.5 hours. 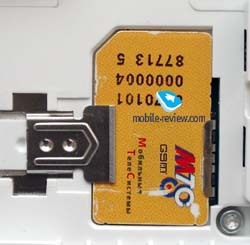 A SIM-card holder is positioned under the battery. 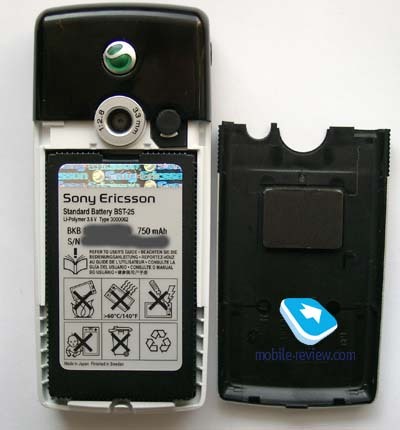 It is a typical construction for all phones from Sony Ericsson. In next parts, which we’ll publish later, you’ll be able to find about 100 real photos of this phone and pictures made by the integrated camera. It will be possible to listen to examples of ringing tones. We also tell about peculiarities of phone’s software, about Java, musical editor and graphical editor, in particular. 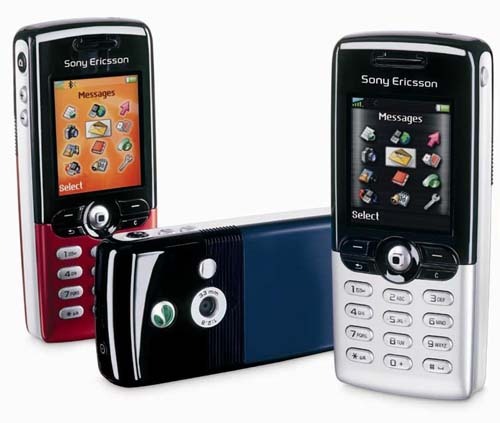 In the end, you’ll know about Sony Ericsson T610-Christmas Edition. See you tomorrow.